Well, she did it! Today was the last class for Wilton 1. And I made sure I had my camera so I could photograph the cake BEFORE we attempted to carry it home. Sadly, last week, the heat from the car melted the cupcakes she designed, thus the lack of pictures from Class 3. 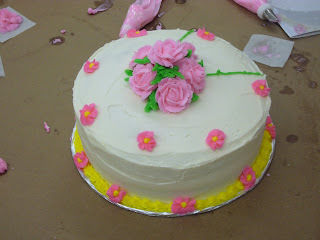 This is not the finished cake - Sabrina got a little crazy with the frosting after I took this picture, but she had alot of fun. 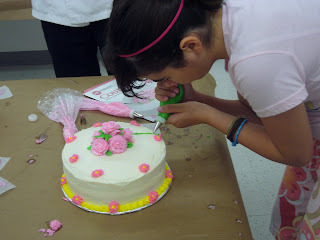 Next Saturday, we start Fondant and Gumpaste. 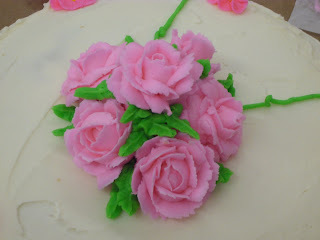 Her grandparents 45th Wedding Anniversary is next month and she has big plans for flowers for the cake. Nice job! It looks lovely.